Choosing an album is a beautiful way to preserve your images and display them all in one place. So many of us store our images digitally, and fail to enjoy the beauty of our family photographs on a regular basis. Your album will be personally designed by me, and handmade in outstanding quality materials, papers and inks. My fine art albums are designed to last a lifetime, or even longer. This is a luxury Christmas gift, unlike any album available on the high street, for the special people in your lives. 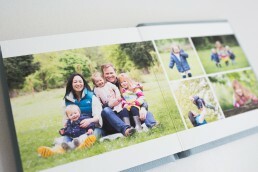 Cover materials, album sizes, number of pages and personalisation are all fully customised for you and your family. I am offering a £200 discount off the list price to all families who have already purchased all of the digital files from our photography session together in 2018. A 6″ x 6″ duplicate copy (ideal for grandparents or a children’s keepsake) can be added on for £99. Additional customisation can be quoted on request. You can download a full brochure detailing album customisation options here. Orders must be placed and paid in full by 30th October 2018 for Christmas delivery and confirmation of this price.